This was taken at Pennypack. A park were I frequently shoot. 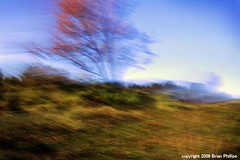 I got this effect using a slow shutter speed than quickly panning the camera after firing the shutter. 99% of the time the results are garbage, but every once in a while I get something kind of cool.